The Strumica Region in the former Yugoslav Republic of Macedonia is vulnerable to heat waves, often resulting in fires in the forests surrounding the city. 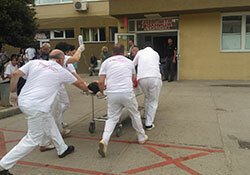 In July 2012 four people lost their lives in the region and many others were injured as a result of just such a fire. In order to strengthen preparedness for crisis situations and climate change related emergencies, a simulation exercise took place on 22 May 2013, the fourth such event. The exercise demonstrated the strong, collaborative relationship between WHO and the health authorities in the former Yugoslav Republic of Macedonia. The key stakeholders were Strumica General Hospital (an important regional hospital centre), Emergency Medical Services, Crisis Management Centre, the Red Cross, fire-rescue units, the Ministry of the Interior and the Ministry of Defence. Prior to the simulation exercise some preparatory meetings were held to establish the parameters of the exercise such as expected casualties, trigger indicators for activating the emergency response plan, triage and patient traffic flow as well as the responsibilities of hospital and emergency medical services staff. The simulation allowed the authorities to test general preparedness and also the implementation of the National Heat Health Action Plan, which was established in the country in 2010 as part of the WHO and German Federal Ministry for the Environment, Nature Conservation and Nuclear Safety (BMU) project: “Protecting health from climate change – a seven country initiative.” The exercise revealed many strengths in the current hospital crisis preparedness plan including strong command leadership, committed and qualified staff and effective management of incoming patients. It also revealed some potential gaps in the system and potential problems that can now be addressed.